2018 marks my 20th year in the salon industry. I started as a receptionist and later transitioned to a management position which is when I first realized my passion for the industry. My evolution continued as I became a licensed Cosmetologist. I have spent years working at some of Cleveland’s top salons and was privileged to work with and be educated by some of the best in the industry. 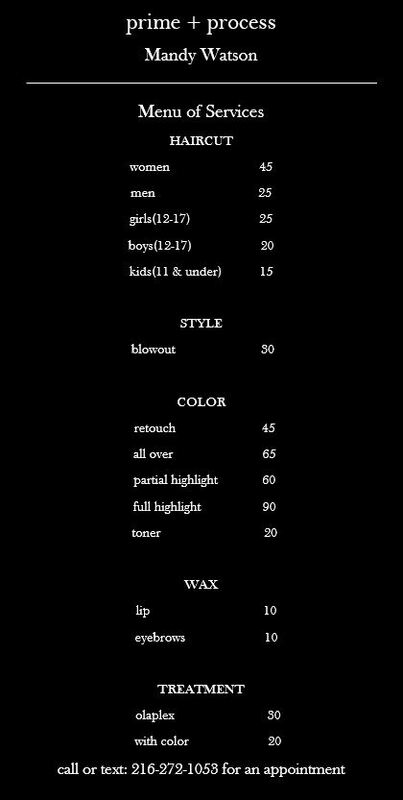 I excel at color formulations, as well as men’s and women’s cuts and have a very flexible schedule offering evening and weekend hours. I am a Licensed Advanced Cosmetologist that has been in the salon industry since 1995. During that time I have worked in top salons throughout North East Ohio, specializing in color application with vibrant fashion colors. Throughout my career I have attended continuing education courses to make sure I stay on top of the latest techniques and styles. 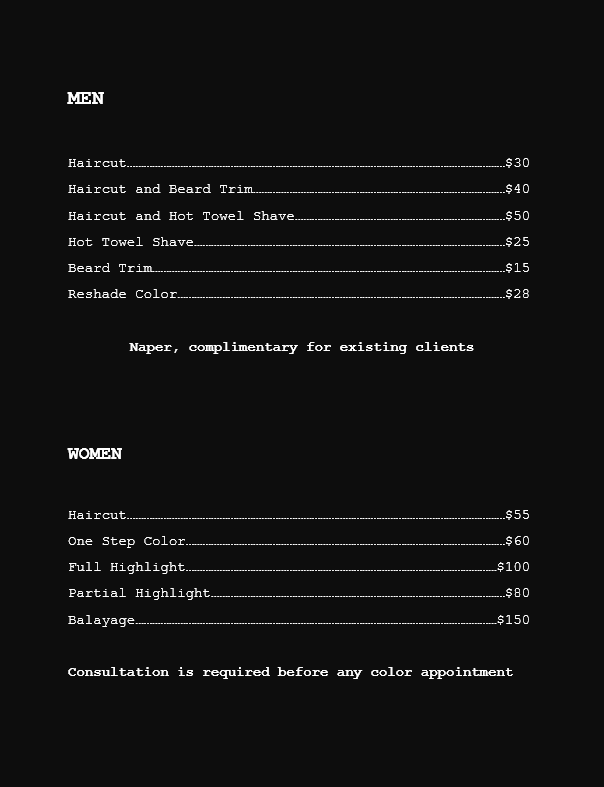 This allows me to offer a wide range of services, such as cuts and color for both men and women. I offer hours on Tuesdays, Thursdays and Saturdays. Call or text: (216)272-1053 to schedule an appointment. I am a Licensed Cosmetologist who has been in the industry for almost ten years. I started my career in Akron, trained by one of the area’s top stylists. As my skills developed, I realized my absolute passion for the industry. My goal is for you to love your hair as much as I love transforming it! I specialize in cuts and color for men and women as well as highlights, short styles, and updos. I am a master barber and stylist with years of experience in the field. Over the course of my career, I have developed my own style – a fusion of a variety of styling and cutting techniques, which allows me to provide my clients with any cut or style. I serve a wide range of clients, from business professionals, to students and athletes. My attention to detail and my passion for the industry has made me one of Cleveland’s leading barbers. Call or text: (440)452-5589 to schedule an appointment. I am a Licensed Manicurist who has been in the industry since 2006. I have been passionate about the beauty industry for as long as I can remember, and started my career as a technician’s assistant while I was still attending high school. 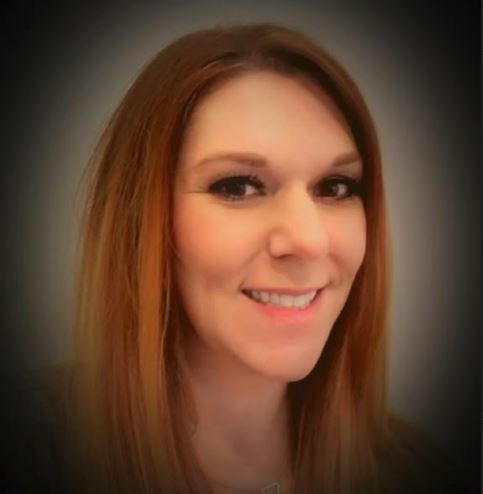 I have continued to grow and follow my passion and have now been a licensed manicurist for 10 years, employed by some of the area’s top salons. Call or text: (440)823-7810 to schedule an appointment. I am a Master Stylist/ Colorist who has been in the beauty industry for over 20 years. I began my career with makeup and quickly earned a spot in Cleveland Magazine’s article, “Best of Cleveland.” I have worked for several top salons in the area and have an absolute passion for this industry. Call or text: (440)670-8779 to schedule an appointment. I am an experienced Licensed Cosmetologist whose focus is to give my clients the best experience possible. To advance my skills and stay on top of the latest trends and techniques I am continuously pursuing continuing education classes and programs to ensure my clients receive the very best! I specialize in balayage, blondes and “lived in” natural styles. Call or text: (440)506-7347 to schedule an appointment. I am a Licensed Advanced Cosmetologist that has been in the industry for about 15 years. I love all aspects of this business from Men’s and Women’s cuts, to color and highlights: including balayage and fashion! I believe in maintaining the integrity of your hair, so formulation is very important to me. Your time is valuable, so when you are in my chair I like to provide a relaxing and fun environment. Call or text: (440)409-2739 to schedule an appointment. I have been in the hair industry for about 15 years and have loved styling hair for as long as I can remember. I attended both the Paul Mitchell Academy and the Aquage Academy where I learned advanced coloring and cutting techniques. I specialize in bridal updos, balayage, and blondes and have trained under some of the areas top stylists. Call or text: (216)701-5450 to schedule an appointment. Call or text: (216)401-1496 to schedule an appointment.